What Does 2017 Hold for Dividend Stocks? 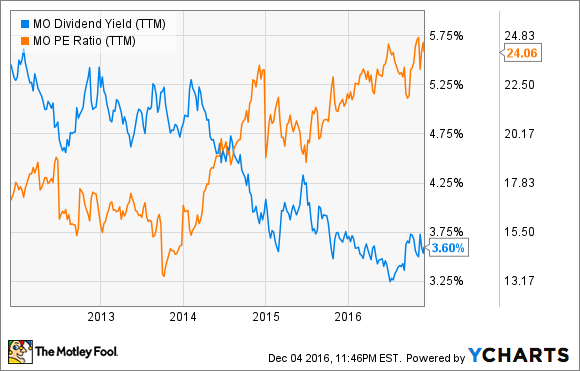 Will dividend stocks continue rallying as interest rates rise next year? Many dividend stocks rallied this year, since low interest rates made them more attractive income investments than bonds. The Vanguard High Yield Dividend ETF, which owns a basket of the top-yielding U.S. stocks, has risen 11% this year and outperformed the S&P 500's 7% gain. But will dividend stocks continue outperforming the overall market next year? Let's examine five key trends to decide. The Fed is widely expected to raise interest rates several times next year, based on the strength of the U.S. economy and the need to keep inflation in check. The Trump Administration's massive infrastructure spending plan could also trigger rapid inflation and push interest rates higher. As interest rates rise, bond yields will improve and make dividend stocks look less attractive for wealth preservation. As a result, many income stocks will likely give up some gains next year. 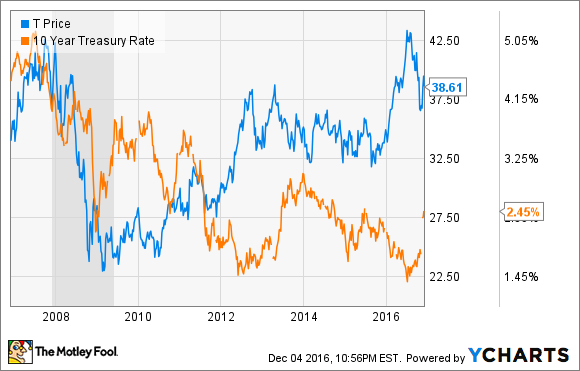 If we compare dividend aristocrat AT&T's (NYSE:T) stock performance to 10-year treasury yields over the past decade, we can certainly see the inverse relationship between the two since the recession. The flight to dividend stalwarts also inflated some of their multiples above industry averages. For example, Tobacco giant Altria (NYSE:MO) trades at 24 times earnings, which is higher than its industry average of 21. The stock's 125% rally over the past five years has boosted its P/E to a multi-year high, while reducing its yield to a historic low. Dividend stocks with high valuations and declining yields could be aggressively sold off in a big market correction. However, that sell-off might make these "inflated" dividend stocks attractive to income investors again. Income investors should also be mindful of the market rotation toward energy and financial stocks. Energy stocks are now back in favor, as stabilizing oil prices reduced concerns that their longtime dividends would be slashed. However, many energy companies are still paying out more than they earn -- ExxonMobil (NYSE:XOM) still has a payout ratio of 138%. Meanwhile, low interest rates prevented banks from gaining new customers with attractive savings account rates, and reduced the interest that they could collect from loans. But as interest rates rise, banks will become more profitable, thus giving them more freedom to hike their dividends. Therefore, Bank of America's forward yield of 1.4% might look paltry now, but it could rise significantly over the next few years. The strength of the U.S. dollar hurt the earnings of many multinational companies in 2016. As interest rates rise next year, the dollar will likely strengthen. Moreover, economic crises in other countries should further bolster the dollar, which is a common "safe haven" currency alongside the Japanese yen and Swiss franc. If currency impacts continue weighing down the cash flows and earnings of these multinational companies, their dividend hikes could be affected. This already happened at tobacco giant Philip Morris International (NYSE:PM), which is based in New York but generates all its revenue overseas. PMI only raised its dividend 2% in 2015 and 2016, compared to respective hikes of 11% and 6% in 2013 an 2014. These headwinds might make it tough to find good dividend stocks, but investors can still find solid stocks trading below industry averages with decent yields. For example, the rotation toward energy and financial companies recently revealed some very reliable dividend plays in the tech sector. IBM pays a forward yield of 3.5% but trades at just 13 times earnings, compared to its industry average of 21. Apple, which fell out of favor due to concerns about peaking iPhone sales, pays a forward yield of 2.1% and trades at 13 times earnings -- which is also lower than its industry average of 17. 2017 might seem like a tough year for income investors, but most dividend stocks reward investors for simply sitting put. Therefore, if your dividend stocks aren't trading at extremely high multiples with unsustainable payout ratios, there's probably no reason to panic. Nonetheless, investors should keep an eye on interest rates, valuations, and other factors to understand how they could affect income stocks.